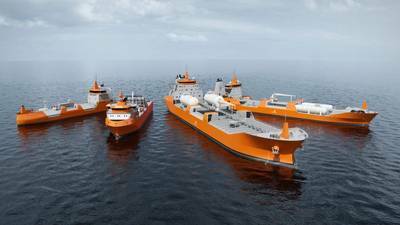 The unmatched track record and expertise that Wärtsilä has in LNG fuel solutions for the marine industry is again emphasised with the company's launching of a new series of LNG Carrier ship designs. This series of designs is the latest addition to Wärtsilä's ship design portfolio and is an important part of the company's strategic programme under the theme "Taking Merchant Shipping into the Gas Age". "Wärtsilä Ship Design has an extensive reference list dating back to 2003 for vessel designs for LNG fuelled ships. The experience and know-how that has been built up during these 15 years has been utilised to develop this latest series of world class designs for LNG Carriers. The entire concept of these designs is to enable the lowest possible fuel consumption, to allow owners to select the ship design that exactly meets their needs, and to provide shipyards with the most convenient and cost effective packages possible," says Riku-Pekka Hägg, Vice President, Ship Design, Wärtsilä Ship Power. More than 4000 vessels have thus far been built based on Wärtsilä designs, including some of the world's most advanced LNG powered ships. According to Mr Hägg; "Our ship designs consistently raise the bar for merchant shipping in terms of efficiency and environmental sustainability." The new designs have been developed at the Wärtsilä Ship Design offices in China and Poland. They will be featured at the CMA Shipping conference and exhibition being held March 23 - 25 in Stamford, Connecticut, USA.